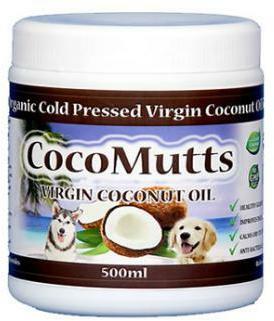 CocoMutts supply a high quality, yet reasonably priced Organic Virgin Coconut Oil especially for dogs. The many benefits of coconut oil for dogs has been known for a long time, yet it is still not widely available and most dog owners will never of heard of the great things that virgin coconut oil can do. CocoMutts aims to change this with our very own virgin coconut oil produced to the highest standard, with the best flavour that your dog will LOVE! Using coconut oil as a dietary supplement is a great way to improve the health and wellbeing of your beloved 4 legged family members. There are several ways that coconut oil can be introduced to your dogs diet. Firstly, and most obviously you can simply feed the solid oil straight from your hand or place in your dogs bowl with their usual food. If you regularly cook food for your dog you can use CocoMutts as a much healthier oil to cook your dogs food with. Most dogs love the taste of coconut, so unlike many other supplements, you shouldn’t have any trouble getting your dog to eat CocoMutts Virgin Coconut Oil. Coconut oil consists of over 90% saturated fats. Most of the saturated fats in coconut oil are Medium Chain Triglycerides (MCTs). The main component of which is lauric acid (found in mothers breast milk), followed by capric acid and caprylic acid. Most of the benefits come from the MCTs. The lauric acid in coconut oil has antibacterial, antiviral, and anti fungal properties. Capric and Caprylic acid have similar properties and are best known for their anti-fungal effects. This means that coconut oil is great for treating and preventing many digestive disorders and infections such as IBS and Colitis. MCTs are efficiently metabolized to provide an immediate source of energy, enhancing athletic performance. The MCTs in coconut oil balance the thyroid, which can also help overweight dogs lose weight. CocoMutts can help to improve arthritis and reduce joint pain, help to prevent and control diabetes, improves overall skin and coat condition, improves digestion and nutrient absorption and reduce both bad breath and doggy odour. Coconut oil is a great addition to any dogs diet, whatever the breed, size and age. Simply adjust the amount to suit your dog. Below you’ll find some of our most frequently asked questions about our Virgin Coconut Oil and the use of the CocoMutts. Can CocoMutts be used by humans? CocoMutts is 100% human food grade oil in food grade packaging and is fully HACCP Certified, meaning it is completely safe for human consumption. Once purchased, a good level of hygiene should be maintained, ie: Not putting a spoon that the dog might have licked back into the jar. It’s also great for human skin and hair, so you don’t have to use it all on the dog! Can I cook my dog’s food using CocoMutts oil? Yes you can. If you cook home made food for your dogs then coconut oil is the perfect oil to use. It’s much healthier than using any other fat and it’s a great way to introduce the benefits of coconut oil to your dogs diet. Can i give CocoMutts to any breed of dog? Absolutely! CocoMutts is great for any dog, of any breed and any size. Just adjust the amount to suit your dog. Can I use CocoMutts for cats? Absolutely. CocoMutts can be fed and used topically on cats, not just dogs. As cats are generally considerably smaller than most dogs they can be more sensitive to the amount eaten, so it’s important that you feed the correct amount. Does CocoMutts work as a de-wormer and/or flea treatment? Coconut oil can help with preventing parasite infestations such as worms and fleas. Your dog will love CocoMutts but thankfully fleas do not. Virgin coconut oil has been known to remove fleas within minutes when applied directly to the coat & skin. (the house should also be treated at the same time to prevent re-infestation). Regular application will not only keep fleas away but will keep your dogs coat healthy, shiny and smelling great. How is CocoMutts oil made? 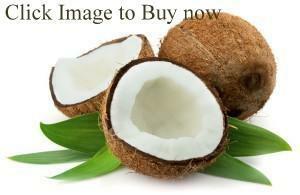 CocoMutts coconut oil is produced from the flesh of fresh coconuts. Fresh coconuts are picked and then squeezed using a press to extract the oil. This oil is then filtered to ensure a finished product that is 100% natural and pure. At no time is the oil heated or treated in any way, and nothing is ever added or taken away. How much CocoMutts should i feed? CocoMutts recommends feeding upto 1 teaspoon of oil per day for every 10kg of the dog’s body weight. For example: if your dog is 20kg, then you can feed 2 teaspoons per day. For larger dogs we recommend feeding 1 teaspoon at a time several times a day. It’s important that you gradually build up to the required amount slowly over several days. We suggest starting with 1 quarter of the recommended amount per day. If you notice slightly oily stools just reduce the amount slightly and build up the amount at a slower pace. All dog’s react differently to new introductions in their diet and you need to find the right balance for your dog. Is it true that coconut oil can help to heal wounds/bites and skin problems? It is true! Coconut oil has natural antibacterial, antiviral and antifungal properties. When applied directly to wounds, stings, bites, hot spots or skin irritations, CocoMutts can help the healing process and keep the area free from bacteria, helping to prevent infection. Whats the difference between CocoMutts and cheaper supermarket coconut oils? The difference is very simple, CocoMutts is 100% pure and natural and is produced from freshly picked coconuts. Cheaper coconut oils are often made from dried coconuts and are usually heat and/or chemically treated. This treatment significantly reduces the quality of the oil, reduces the amount of goodness the oil contains and also removes the flavour which makes it much less appealing for your dogs to eat.